Each February, Baylor celebrates the legacy of the university's Founders, Judge R.E.B. Baylor and Pastors William Milton Tryon and James Huckins. On Feb. 11, the Baylor family gathered in Waco Hall during one of our cherished campus traditions, Chapel, to present one of Baylor University's most prestigious awards, the Founders Medal, to distinguished alumnus and Regent Emeritus Drayton McLane Jr.
Baylor's three principal founders were leaders of vision, courage and conscience who lived sacrificially to serve others. So too, over the course of his magnificent career, Drayton McLane Jr. has demonstrated extraordinary and visionary leadership. Inspired by the love of dedicated parents and equipped by his Baylor education, Drayton has succeeded greatly in business, yet chose all the while the role of servant-leader. Drayton, his wife, Elizabeth, sons Drayton III and Denton, and their families joyfully embrace our Lord's admonition that "to whom much is given, much is required." Happily, Baylor has been a great beneficiary of Drayton's faithful obedience and generous giving. 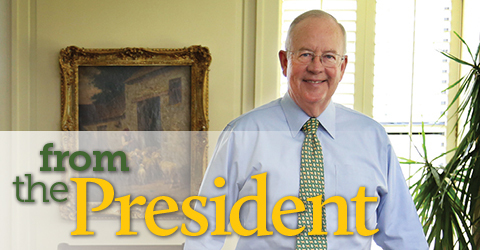 A determined advocate for the ever-growing needs of his alma mater, Drayton has advanced the university's mission through generous support both for student scholarships and transformative capital projects, such as the McLane Student Life Center and our now-under-construction Baylor Stadium. In the spirit of the university's founding generation, Drayton McLane, Jr. is richly deserving of the distinction of Baylor Founder. Our newest Founders Medal recipient represents a powerful example of a proud member of that Good Old Baylor Line. A recent national survey of Baylor alumni assures us that, all across the nation, our alumni feel the same way. To assure impartiality, this scientific survey was conducted by the nationally-respected survey center at the University of New Hampshire. Once again, the results are impressive. With the aid of these survey results, our university continues to learn how to be increasingly effective in serving and engaging our 165,000 alumni. We are thankful for the decade-long work of the Baylor Alumni Network under the energetic leadership of our vice president for constituent engagement, the beloved Tommye Lou Davis. Embodying an extraordinarily active and nationally-focused alumni relations effort, the Baylor Alumni Network has rapidly grown to attract many thousands of participants in cities across the country. Our alumni tell us -- both in the national survey and otherwise -- that they want to engage with Baylor in the communities where they work and live. That's why from June 2011 to June 2012, the Baylor Alumni Network held 829 separate events in 147 different cities in 25 states (and Washington, D.C.). Through the combined efforts of the dedicated Alumni Network staff and a nationwide army of more than 600 volunteers, these events engaged more than 33,000 alumni and friends. Through January 2013, barely more than six months into the current fiscal year, the Alumni Network had already held 515 events in 120 separate cities across 24 states (and Washington, D.C). These community-building gatherings have been attended by nearly 21,000 alumni and friends. This is good for Baylor as we rally together to build our university. Please take a minute to find your Baylor Alumni Network connection at www.baylor.edu/network. By God's grace, Baylor University is moving forward on all fronts: academics, faculty teaching and research, student life, alumni relations and athletics. As the alumni survey data show, we are now convinced that future progress at Baylor will depend on all alumni working together to support and propel the university forward. We invite all to join us in this important effort. Our February Board of Regents meeting culminated with an eagerly-anticipated announcement launching fundraising to build a new home for the Hankamer School of Business. This is encouraging. Recently, our university has experienced unprecedented support for several major projects, including Baylor Stadium and the President's Scholarship Initiative. More than 10,000 alumni have chosen to participate in the scholarship initiative; nearly 4,500 of those were giving to Baylor for the very first time. With your help, we are hopeful that we can successfully conclude those campaigns during the course of the coming summer. The Board also discussed the continued development and enhancement of campus facilities. We are increasingly excited about the scheduled August 2013 openings of the new East Village Residential Community, which will house 700 students, and a completely renovated Marrs McLean Science Building, home to Baylor's School of Education and Departments of Anthropology and Statistics. This spring, we have relocated the first Baylor faculty and labs from the Department of Electrical and Computer Engineering and the Center for Astrophysics, Space Physics and Engineering Research (CASPER) into the Baylor Research and Innovation Collaborative (BRIC). We are confident that you will be encouraged to see the steady progress at the BRIC -- and elsewhere -- as we continue to build Baylor together. Under the superb leadership of our executive vice president and provost, Dr. Elizabeth Davis, Baylor continues to attract some of the world's top faculty eager to become an integral part of our mission as a comprehensive research institution with a distinctive Christian identity. We are pleased to welcome to Baylor two highly-distinguished faculty members: world-renowned chemist John L. Wood from Colorado State University and leading New Testament scholar Beverly Roberts Gaventa from Princeton Theological Seminary. Dr. Wood will join the Department of Chemistry and Biochemistry as the Robert A. Welch Distinguished Professor of Chemistry. His appointment is made possible in part by a $4.2 million grant from the Cancer Prevention and Research Institute of Texas. An outstanding teacher and mentor, Dr. Wood's important work promises to push forward the frontiers of cancer research. Dr. Gaventa will join the Department of Religion as Distinguished Professor of New Testament Interpretation. She is one of the world's foremost New Testament scholars. She has a sterling reputation as a scholar/teacher and will build on the great legacy left by her predecessor, Dr. Charles H. Talbert, Distinguished Professor of Religion Emeritus. Baylor is honored to welcome these outstanding scholars as we implement our Pro Futuris strategic vision. At our recent Spring Staff Forum, I was grateful for the opportunity to draw from Matthew's Gospel about the Parables of the Hidden Treasure and the Pearl of Great Price. From the many "sacred spaces" that surround us, to the remarkable museum displays on campus, to the internationally-celebrated Armstrong Browning Library, Baylor abounds with "hidden treasures." But of extraordinary value to the fulfillment of our mission are the dedicated Baylor staff, who make it a joy to serve here daily. Each spring, we recognize Outstanding Staff Award recipients, who are nominated by Baylor faculty and staff colleagues for their exceptional service. It is a privilege to honor the winners of our Outstanding Staff Awards. I also commend Baylor staff who have generously supported The President's Scholarship Initiative. This past fall, Baylor's Staff Council announced that its Endowed Scholarship Fund Honoring Baylor Staff had reached its goal -- a year early -- thus enabling the scholarship funds to be currently available to aid deserving students. Mira Benthul, a freshman English major from Lorena, Texas, was selected as the inaugural recipient of this endowed scholarship. We have been blessed to welcome to the Baylor campus some of our country's outstanding public servants and scholars. Justice Sandra Day O'Connor, former Secretary of State Condoleezza Rice, Yale Law Professor Akhil Reed Amar and legendary entrepreneur T. Boone Pickens have participated in our "On Topic" program, a series of conversations about important issues facing our nation. On April 16, we will be honored by a visit to Baylor by former United States Senator George J. Mitchell. A former federal judge, Senator Mitchell's remarkably distinguished career includes 15 years in the Senate; chairmanship of the International Commission on Disarmament in Northern Ireland; and chairmanship of the International Fact Finding Committee focused on the Middle East crisis between Israel and the Palestinian Authority. In addition, in 2007, Senator Mitchell was author of "The Mitchell Report," an investigation into the use of performance-enhancing drugs in Major League Baseball. We anticipate a compelling conversation with one of the leading public servants of our time. For more information on this event, please visit www.baylor.edu/president/mitchell. If you weren't able to join us in Waco Hall for previous "On Topic" conversations, you may access those via streaming video at www.baylor.edu/president/ontopic. A great spirit now prevails among all Big 12 Conference member institutions -- and a tremendous level of excitement and enthusiasm at Baylor. Construction is well under way on our $250 million Baylor Stadium, which we anticipate opening for the Bears' first football game of the 2014 season. In January, we dedicated the 34,000-square-foot Jim and Nell Hawkins Indoor Tennis Center for Baylor's men's and women's tennis teams. Our student-athletes are proving yet again that Baylor performs with excellence not only on the field, but in the classroom. No fewer than 129 student-athletes from Baylor's varsity sports were named to the Fall 2012 Dean's List, including 59 who achieved a perfect 4.0 GPA. Sic 'em, Bears! We must always honor the leadership of those who have gone before -- in this nation, under God, which stands "for liberty and justice for all." And in the same spirit, we also honor our many generous alumni, such as Drayton McLane Jr., who lead us in the present age and stand as this generation's bold and courageous Baylor Founders. A version of this letter was sent by email on Feb. 18 to all Baylor alumni for whom the university has a valid email address. To ensure that your contact information is up to date, please visit network.baylor.edu.